Unbeknownst to most people, there’s a whole secret world full of busy, busy people at this time of year. All around the planet, toy makers, card makers, designers and craft workers are beavering away in a land of tinsel, holly, Santa, snowflakes and sparkles. For the last few weeks, I’ve joined the ranks and turned my creative attention to the forthcoming holiday season… Is it too soon to use the ‘C’ word?! Admittedly, in Ireland, we don’t get great weather, and the summer season was a write-off, but nevertheless, there’s no sign of winter outside. Yet, inside, I’m dreaming of a Christmas tree, heavy with decorations, glistening near a log fire… of mittens, woolly hats and scarves keeping little children warm while they play outside in the snow… of frosty nights, starry skies, and counting the number of sleeps ’til the Big Man himself pays his visit! My studio has become a hive of festive activity, even though it’s only September! And, I’m getting into the spirit of it all… here’s a sneak peek at the results so far! 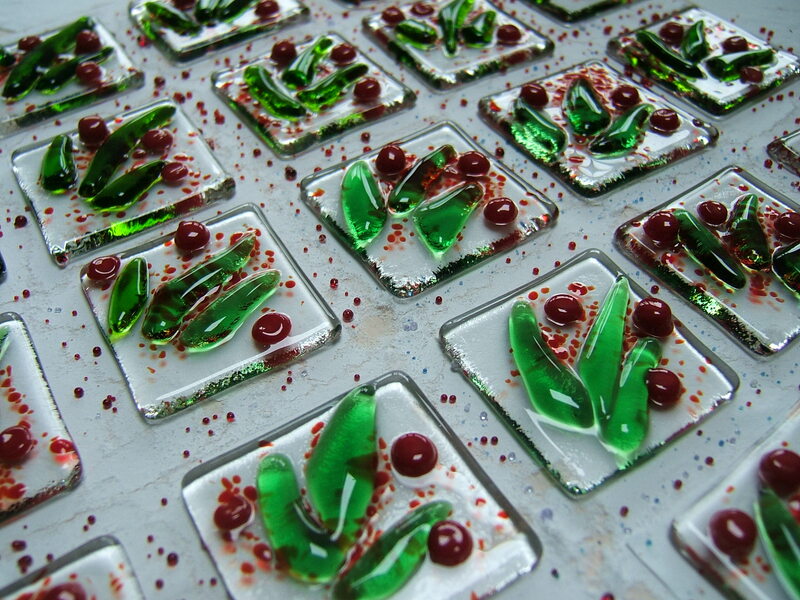 Little fused glass holly decorations, just coming out of the kiln! If you’d like to get your hands on my little decorations, you can order them on Etsy … Happy Holidays! !